Approximately 3 out of every 100 pregnancies is a twin or multiple pregnancy. Normally during your first ultrasound scan it will be determined whether you are having more than one baby although it may take the entire nine months for you to get over the shock. Not always but in many cases a woman who is having twins or multiple babies will find their tummy gets bigger quicker and the normal symptoms of pregnancy may be amplified. Symptoms of twin pregnancy include vomiting early in pregnancy, being out of breath, and having lots of stomach acid, swollen ankles, hemorrhoids and hypersensitivity. There are two types of twin pregnancy. Fraternal (dizygotic twins) arise when two ova are fertilized by two sperm cells. Each baby gets his own placenta and sac. The twins are not identical, they are, as it were, brothers or sisters, but born at the same time. 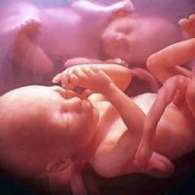 This type of twin pregnancy can be genetic and can often skip a generation before happening again. The second type of twins is called identical (monozygotic) twins and happen as a result of one egg and sperm fusing then splitting into 2 separate babies. Identical twins may not look the same but they will share exactly the same genetic information (DNA).